On Sundays, before you go home and really evaluate your decisions of the night, before the fog clears from your head revealing all that has happened to the light of day, there is the time honored tradition of brunch and bloodys. This past weekend, at nine in the morning, the sun barely beginning to warm the chilly streets of Portland in Fall, my companions and I descended upon Tasty n Sons with this purpose. One of us had been wise enough to make a reservation, which proved an incredible blessing as the line stretched halfway down the block. I received a number of glares as I strolled past pre-patrons, but once inside I was greeted warmly and shown to my group’s table. Those of you who have read my personal blog probably already know, but for the rest of our readers let it now be known, I love whiskey. Of all the spirits in all the world, each with their own draw, purpose and flavor, I always come home to whiskey. 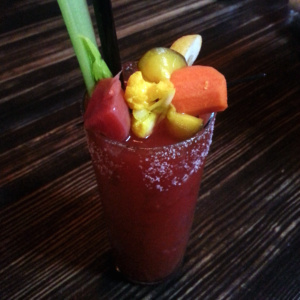 And so, when I saw one of their specialties, the Bloody Molly, crafted with whiskey, I had to indulge. And an indulgence it was. Delicious from the first sip. The smooth initial taste of the whiskey mingled perfectly with the classic flavors, greeting me like an old friend. Then, the after bite. The tantalizing tummy tingle that reminded me this friend knows how to get the job done. The spice began to clear me up while the whiskey warmed me, and suddenly the decisions of yesterday don’t even matter, because today is the now, and the now is wonderful! I sat back in my seat, crunching on the celery and eating (gobbling) the pickled veggie garnish. Before the actual meal had arrived, I’d already ordered another bloody. I probably would have basked in these bloodys all day, if I could have. From a lover of whiskey and bloodys, I give the Bloody Molly 4 celery stalks. For those who don’t love whiskey (heathens), there is a wide variety of other bloodies to choose from, and I understand one of our other writers will soon be reviewing one of them. Tasty n Sons 3808 North Williams Avenue, Portland, Oregon 97212. T: (503) 621-1400.